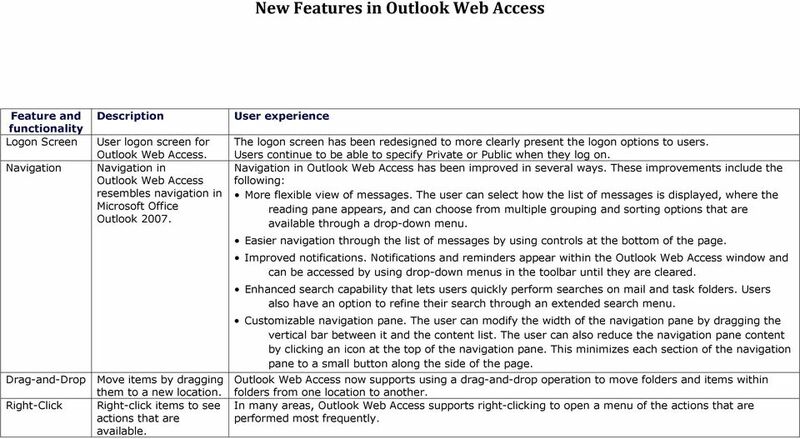 Download "New Features in Outlook Web Access"
1 New Features in Feature and functionality Logon Screen Navigation Description User logon screen for Navigation in resembles navigation in Microsoft Office Outlook Drag-and-Drop Move items by dragging them to a new location. Right-Click Right-click items to see actions that are available. User experience The logon screen has been redesigned to more clearly present the logon options to users. Users continue to be able to specify Private or Public when they log on. Navigation in has been improved in several ways. These improvements include the following: More flexible view of messages. The user can select how the list of messages is displayed, where the reading pane appears, and can choose from multiple grouping and sorting options that are available through a drop-down menu. Easier navigation through the list of messages by using controls at the bottom of the page. Improved notifications. Notifications and reminders appear within the window and can be accessed by using drop-down menus in the toolbar until they are cleared. Enhanced search capability that lets users quickly perform searches on mail and task folders. Users also have an option to refine their search through an extended search menu. Customizable navigation pane. The user can modify the width of the navigation pane by dragging the vertical bar between it and the content list. The user can also reduce the navigation pane content by clicking an icon at the top of the navigation pane. This minimizes each section of the navigation pane to a small button along the side of the page. now supports using a drag-and-drop operation to move folders and items within folders from one location to another. In many areas, supports right-clicking to open a menu of the actions that are performed most frequently. 2 Arrange By Choose how messages are arranged. Address Book The improved Address Book makes it easier for users to search Address Lists and Contacts. Calendar Flagging Messages Junk The Calendar has been improved to make it easier for users to find information and manage their schedules. Flagged messages automatically appear in Tasks. Manage junk from The Arrange By selection is available in message folders, such as the Inbox. By clicking Arrange By, the user can arrange messages by date, from, and other options. Conversation is a new option that arranges messages in a threaded view by subject. The Address Book in Exchange 2007 includes the following improvements: Easier and more efficient searching for information in Address Lists and Contacts. Clearer options when you are using the Address Book to select meeting attendees and resources. The Address Book provides options to limit the view to resources, or to limit the search to specific address books. When users compose messages or meeting invitations, they can select any recipient field or click the Address Book icon in the mail form to search the Address Book for recipients or resources, such as meeting rooms. The Calendar includes the following improvements: Faster access to meeting details through the optional reading pane in the Day and Week views. Faster navigation through the calendar by using the date picker in the navigation pane. Multiple view options enable users to view their calendar by using week, work week, or single day views. The ability to modify calendar items by dragging them to a new time. When a user adds a follow-up flag to a message, it automatically appears in Tasks. Users can review the contents of the Junk folder in, and move any messages that have been incorrectly designated as junk to the Inbox by selecting them and clicking the Not Junk button on the toolbar. 3 Scheduling Assistant Search Reminders and Notifications The Scheduling Assistant makes it easier to find times and resources for meetings. The Search function in has been re-designed to provide more accurate and faster results and to reduce manual work and time that is spent finding items in a mailbox. Exchange 2007 Outlook Web Access includes several changes to the Reminders and Notifications features. When scheduling a meeting, users can switch from the Appointment tab to the Scheduling Assistant tab to add attendees, search for a conference room, and find a meeting time. The Scheduling Assistant offers the following enhancements: Improved management and scheduling of meeting attendees and meeting locations. The user can enter the names of meeting attendees or meeting rooms directly in the Scheduling Assistant or perform an advanced search by using the Address Book. An easier way to search for meeting times when all attendees and resources are available. The Suggested Times section of the Scheduling Assistant uses free/busy information to choose optimal times for attendees and resources. Promising times are color-coded and labeled as Great, Good, or Poor. The availability of each attendee and resource is organized by Required, Optional, and Resource. The Search feature contains the following improvements: Quick access to basic search of any folder through the search window at the top of each folder list. One-click access lets users extend the search to other folders by using the drop-down list next to the search field. Advanced search by using the expansion icon next to the search window. Advanced search lets users specify what part of messages, contacts, or tasks to look in. It also lets them search based on From or To values and to search by category. The Reminders and Notifications features include the following improvements: Reminders and notifications are presented as an overlay on the current Web browser window. Users can click Reminders to view a list of current reminders. Reminders is located in the upper-right corner next to the Help icon. Notifications that new mail has arrived are less distracting than in earlier versions of A notification appears as a brief overlay to the main window. A user can access the newest message by clicking the notification. Notifications tell the user whether the new message is an message, a voice mail message, or a fax message. 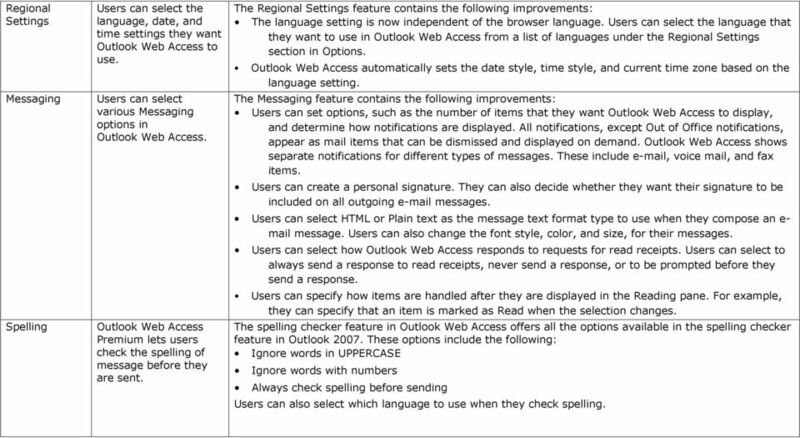 4 Regional Settings Messaging Spelling Users can select the language, date, and time settings they want to use. Users can select various Messaging options in Premium lets users check the spelling of message before they are sent. The Regional Settings feature contains the following improvements: The language setting is now independent of the browser language. Users can select the language that they want to use in from a list of languages under the Regional Settings section in Options. automatically sets the date style, time style, and current time zone based on the language setting. The Messaging feature contains the following improvements: Users can set options, such as the number of items that they want to display, and determine how notifications are displayed. All notifications, except Out of Office notifications, appear as mail items that can be dismissed and displayed on demand. shows separate notifications for different types of messages. These include , voice mail, and fax items. Users can create a personal signature. They can also decide whether they want their signature to be included on all outgoing messages. Users can select HTML or Plain text as the message text format type to use when they compose an e- mail message. Users can also change the font style, color, and size, for their messages. Users can select how responds to requests for read receipts. Users can select to always send a response to read receipts, never send a response, or to be prompted before they send a response. Users can specify how items are handled after they are displayed in the Reading pane. For example, they can specify that an item is marked as Read when the selection changes. The spelling checker feature in offers all the options available in the spelling checker feature in Outlook These options include the following: Ignore words in UPPERCASE Ignore words with numbers Always check spelling before sending Users can also select which language to use when they check spelling. 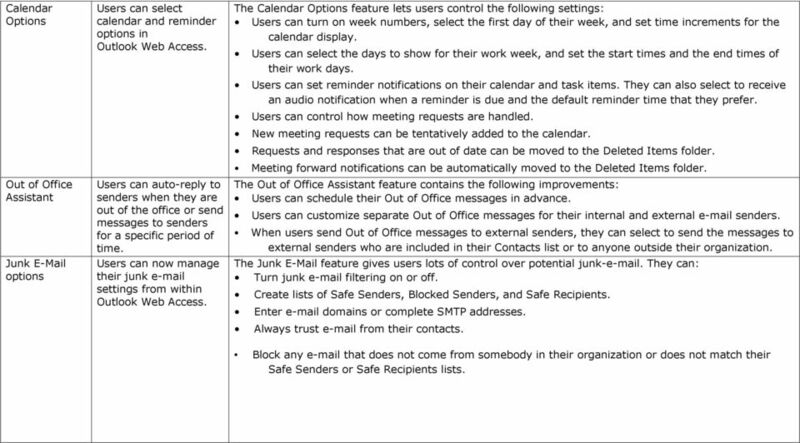 5 Calendar Options Out of Office Assistant Junk options Users can select calendar and reminder options in Users can auto-reply to senders when they are out of the office or send messages to senders for a specific period of time. Users can now manage their junk settings from within The Calendar Options feature lets users control the following settings: Users can turn on week numbers, select the first day of their week, and set time increments for the calendar display. Users can select the days to show for their work week, and set the start times and the end times of their work days. Users can set reminder notifications on their calendar and task items. They can also select to receive an audio notification when a reminder is due and the default reminder time that they prefer. Users can control how meeting requests are handled. New meeting requests can be tentatively added to the calendar. Requests and responses that are out of date can be moved to the Deleted Items folder. Meeting forward notifications can be automatically moved to the Deleted Items folder. The Out of Office Assistant feature contains the following improvements: Users can schedule their Out of Office messages in advance. Users can customize separate Out of Office messages for their internal and external senders. When users send Out of Office messages to external senders, they can select to send the messages to external senders who are included in their Contacts list or to anyone outside their organization. The Junk feature gives users lots of control over potential junk- . They can: Turn junk filtering on or off. Create lists of Safe Senders, Blocked Senders, and Safe Recipients. Enter domains or complete SMTP addresses. Always trust from their contacts. Block any that does not come from somebody in their organization or does not match their Safe Senders or Safe Recipients lists. 6 Search Folders Search folders are virtual folders that provide a view of e- mail items that match a set of criteria. For example, the default Search folder Unread contains a view of all unread messages. The Search Folders icon is always visible in, even if you have disabled the feature. Custom Search folders that a user has created in Microsoft Office Outlook will not be visible unless they have been initialized on the server that is hosting the user's mailbox. Search folders that are created in Outlook when users are working in Online mode are automatically initialized on the server. Custom Search folders that are created when users are using Outlook in Cached Exchange or Offline mode are not automatically initialized on the server and will not be visible in To initialize these folders on the server, switch Outlook to Online mode and open each of the Search folders. You can then switch back to Cached Exchange mode. Change Password General Settings Users can change their Active Directory account password in A set of miscellaneous settings that control the user experience. Deleted Items Users can decide how handles deleted items. By using Change Password in Options, users can change their Active Directory password. If the user account is in a different forest from the Exchange server, the password expiration warnings will not work. Users can set the following options in General Settings: Name Resolution In the Premium version of, users can select whether to check first in the Global Address List or Contacts. This option is set in Messaging in Light. Appearance Users can select the color scheme that they want to use for their session. Accessibility In Premium, users who are blind or have low vision can select Use the blind and low vision experience in the Accessibility section. This setting is set in Accessibility in Light. In for Exchange 2007, users can set to automatically empty their Deleted Items folder when they log off. This option is set in Messaging in light. 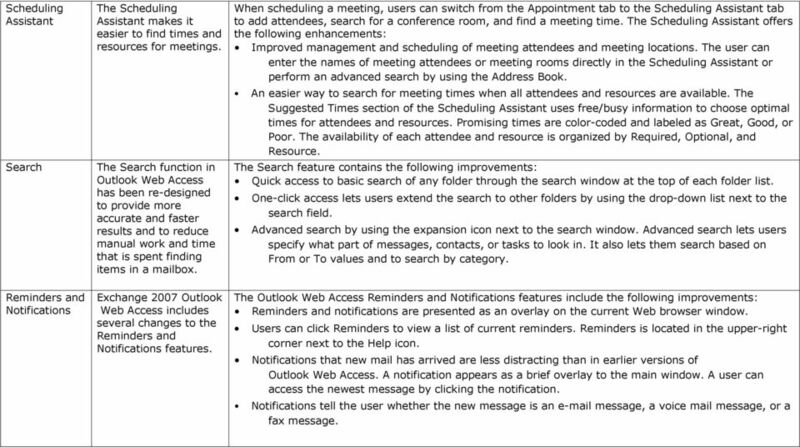 Outlook Web App OWA Quick Guide. Getting you up to speed quickly. Student Office 365 Outlook Web App OWA Quick Guide. Getting you up to speed quickly. Using Webmail. Document Updated: 9/08. Technical Manual: User Guide. The Webmail Window. Displaying and Hiding the Full Header. Using Webmail. Technical Manual: User Guide. Document Updated: 1/07. The Webmail Window. Displaying and Hiding the Full Header. Outlook basics. Identify user interface elements that you can use to accomplish basic tasks. GroupWise to Outlook: How Do I? GroupWise to MS Outlook 2007 "GroupWise to MS Outlook 2007" The following is a list of GroupWise features with the equivalent names and brief instructions for performing similar actions in Microsoft Outlook. Outlook Web App (OWA) is accessible from any compatible web browser, on or off campus. It is available to all users of the UR Exchange 2010 email service. These basic instructions will get you started. Outlook 2010 basics Microsoft Outlook 2010 is the world s leading personal information management and communications application. Outlook 2010 delivers complete e-mail, contact, calendar, and task functionality. How is Webmail Different than Microsoft Outlook (or other e-mail program)?